Surfer Robby Naish visited Costa Rica in search of some of the longest waves in the world, which took him to the Pacific coast of the Central America country, specifically to Pavones and Boca Barranca, which are famous destinations for wave seekers. This photo August 2010 provided by RMS Titanic Inc., shows CThe last davit remaining on the wreck of RMS Titanic. These lifeboat cranes were used to hoist the Ship's wooden lifeboats over the side and into the water during Titanic's sinking. Many of the boats launched soon after the sinking were not close to full—passengers refused to believe the seriousness of the situation. Scientists showed some never-before-seen images of the Titanic in a Virginia courtroom Thursday, unveiling dramatic three-dimensional views of the rusting hulk and the ghostly images of the sea floor where the ship sank almost a century ago. The Titanic struck ice while making its maiden voyage on April 12, 1912, about 400 miles off Newfoundland, Canada. More than 1,500 of the 2,228 passengers and crew perished as the liner plunged into the deep. The images taken from a remote-controlled submersible vehicle were shown to a judge Thursday amid an ongoing salvage claim involving the world’s most famous shipwreck. This August 2010 photo provided by RMS Titanic Inc., shows the port side of the bow section. The rip in the hull can be seen clearly at right, with the stern coming to rest several thousand feet away. The small rectangular windows admit light into Titanic’s famous suites, while the square windows on the left mark the “Private Promenade” reserved for exclusive use of those booking the best shipboard accommodations in the world. Scientists who took part in a 2010 expedition to the North Atlantic wreck site said the images are the most extensive and highest quality ever taken of the Titanic. The expedition also fully mapped the 3-by-5-mile wreck site, which is located 2 1/2 miles below the ocean’s surface. The experts said the entire debris field has now been documented for the first time. The new images will ultimately be assembled for public viewing, scientists said, and to help oceanographers and archaeologists explain the ship’s violent descent to the ocean bottom. It is also intended to provide answers on the state of the wreck, which scientists say is showing increasing signs of deterioration. This photo August 2010 provided by RMS Titanic Inc., shows First Class Window: This photo taken at Titanic’s wreck site displays two windows from first-class cabins. The window on the left leads to Stateroom W, while the window on the right leads to Stateroom U Scientists were in court in Norfolk Va. revealing never-before-seen images of the Titanic and the ocean bottom where the violently strewn remnants of the world's most famous shipwreck rest nearly a century after it sank on its maiden voyage. The findings were presented in a federal courtroom in Norfolk where a salvage claim is still being decided 26 years after the Titanic was discovered by oceanographer Robert Ballard. The most striking images involved the 3-D tour of the Titanic’s stern, which lies 2,000 feet from the bow. Attorneys and court visitors donned 3-D glasses as a camera in a remote-controlled submersible vehicle skimmed over the stern, seemingly transporting viewers through scenes of jagged rusticles sprouting from deck, a length of chain, the captain’s bathtub, and wooden elements that scientists had previously believed had disappeared in the harsh, deep ocean environment. This August 2010 photo provided by RMS Titanic Inc., shows Captain Smith’s Bathtub aboard the sunken ship. The plumbing allowed the Captain a choice of salt or fresh water, hot or cold. The images were gathered last year using submersibles that were either tethered to a research vessel or programed to skim the ocean floor — “mowing the lawn,” in the words of one scientist. The scientists said previous sonar and optical images were random and akin to snapshots, while the expedition strived to record and map every inch of the wreck and its resting place using the latest recording technologies. Individual images are stitched together in a mosaic process to create large-scale, almost panoramic views of the wreck. “We have an image of everything. That’s what’s important,” said William N. Lange of the Woods Hole Oceanographic Institution in Massachusetts. The cameras did not probe the interior of the wreck. The 2010 expedition, which included many veterans of past Titanic expeditions, was organized by RMS Titanic Inc. The company has exclusive rights to salvage the Titanic, and has gathered nearly 6,000 objects from the once-opulent cruise ship. They are valued in excess of $110 million. U.S. District Judge Rebecca Beach Smith ruled last year that RMS Titanic is entitled to full compensation for the Titanic trove, but has not determined how it will be paid. The hearing Thursday was intended, in part, to demonstrate the extraordinary costs to RMS Titanic of organizing the risky expeditions and salvage operations. The seas above the wreck are commonly raked by fierce storms, and the wreck site is pitch black and subject to powerful deep-ocean currents. Chris Davino, president and CEO of Premier Exhibitions, RMS Titanic’s parent, estimated the cost of the 2010 expedition at $4 million to $5 million. He said company officials have not decided whether they will launch another salvage expedition. Scientists said the images collected by the expedition will someday be available to the public to explore the wreck, navigating the ocean depths as a teenager operates a video game with joy sticks. Some of the individual images were startling in their detail and grandeur. Huge boilers and engines seemed frozen in time as they rose from the ocean bottom. Since Ballard and an international team discovered the Titanic, most of the expeditions have either been to photograph the wreck or gather thousands of artifacts, like fine china, shoes and ship fittings. “Titanic” director James Cameron also has led teams to the wreck to record the bow and the stern. RMS Titanic made the last expedition to site in 2004. The company conducts traveling displays of the Titanic artifacts, which the company says have been viewed by tens of millions of people worldwide. 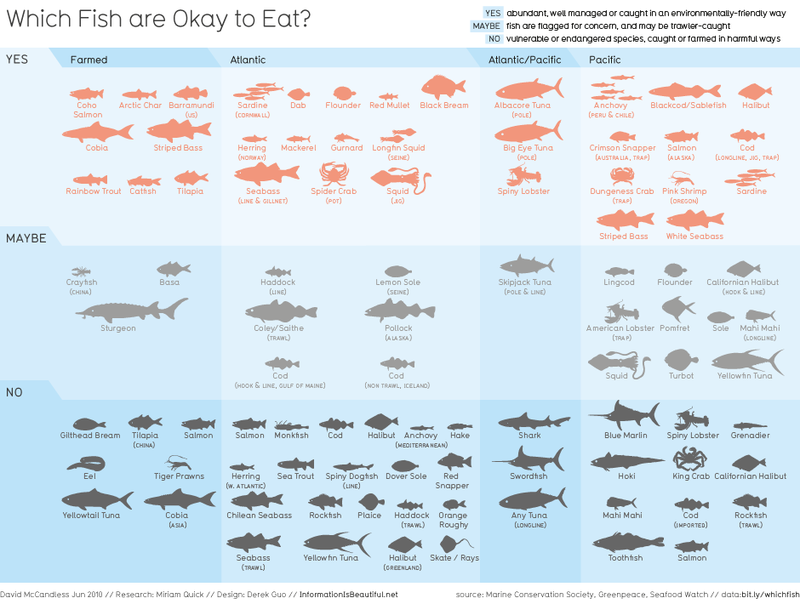 Which fish are good to eat? Over-exploitation. Destructive fishing techniques. Polluting fish farms. If you want to eat ethically, which fish are actually fine for your fork? In an age of over-fishing and crashing marine stocks, it's difficult to keep track of which fish are ethically kosher. Here I've pooled and visualized the latest consensus and data from the Marine Conservation Society (PDF), Greenpeace and the SeaFood Watch. Check the data for yourself here. As ever, it's a pretty grim picture. Although there is some good news. Mussels, clams and oysters are all good to eat. Hopefully this visual snapshot will help you enjoy a cleaner conscience and a slap-up dinner of ocean-friendly fish'n'chips. New interpretations of the Antikythera Mechanism reveal that it could be used to predict eclipses, and that it had a dial recording the dates of the ancient Olympiads. The Department of Alexandria has organized a conference and exhibition on ”Science and Technology in Ancient Greece”, on June 8, 2011. The Associate Professor at the University of Athens Xenofon Mousas will give a talk on ”Antikythera Mechanism, the First Mechanical Universe and Computer”. Nefertiti Megahed, Professor of Mathematics at the University of Cairo will talk about ”Maths in the Mediterranean: Egypt and Greece”. Dr. Flora Vafea will focus on Αstrolabe (astronomical instrument that locates and predicts the position of stars and planets). The exhibition will contribute in a more global presentation of the topic, which designates the relations between Greek and Egyptian civilizations; two civilizations that were developed around the Mediterranean Sea. At the end of talks, another topic related to the photograph exhibition will be inaugurated. The presentation includes photographs of the Antikythera Mechanism, accompanied by short texts in Greek and Arabic. This mechanical wonder was found by a diver exploring a shipwreck off the coast of Greece in 1900. It is an ancient analog computer, built around 150 BC, that calculated astronomical positions and the dates of upcoming Olympic games. The machine is built as an interlocking system of gears and rivals 19th-century Swiss clocks for accuracy and complexity. With it he accurately predicted the upcoming solar eclipse of April 8, 2024. 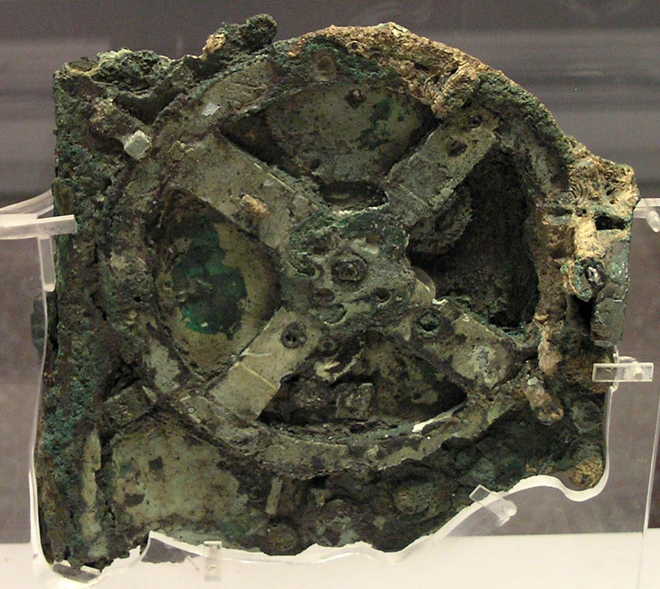 The Antikythera Mechanism, is one of the most globally important discoveries of the Antiquity. It is the oldest known complex scientific calculator, as well as astronomical clock and planetarium. It is considered to be one of the most advanced astronomical clocks discovered in Europe, especially after the 14th century. It was maintained for 23 centuries at the bottom of the sea and was discovered in a shipwreck, in Antikythera by Symian divers around 1901-1902. The ship carried priceless treasures from Greece to Rome. Today, the Antikythera Mechanism can be found in the Archaelogical Museum of Athens. The exhibition was designated by Xenofon Mousas, Member of the International Mechanism Study group, the results of which are based the reconstructions in computers and cartoon films, as presented in the exhibition. The exhibition presents the evolution of Greek astronomy and astrophysics, which became a real science in Greece due to the use of appropriate maths and physics that allow the comprehension, interpretation and prediction of astronomics through evolving mathematical models. The exhibition will be presented in Greece, Cyprus and many more countries around the world. Estimates of the daily mean position in the north Pacific of the six marine predator groups studied. Top, left to right: tuna (yellowfin, bluefin, albacore); pinnipeds (northern elephant seals, California sea lions, northern fur seals); sharks (salmon, white, blue, common thresher, mako). Bottom, left to right: seabirds (Laysan and black-footed albatrosses, sooty shearwaters); sea turtles (leatherback, loggerhead); cetaceans (blue, fin, sperm and humpback whales). Two vast areas of the north Pacific Ocean, one off the west coast of the United States and the other between Hawaii and Alaska, have been revealed as marine counterparts of East Africa's Serengeti plain. Teeming with life, these oceanic 'hotspots' provide major migration corridors for large marine predators ranging from tuna to whales. The discovery comes from a huge data set that synthesizes and compares the seasonal migration patterns of 23 species of predators. The findings are published today in Nature. Between 2000 and 2009, the species were tracked under the Tagging of Pacific Predators (TOPP) programme, part of the Census of Marine Life international collaboration. Electronic tags attached to the animals recorded their movements and the water conditions around them, including temperature, salinity and depth. The data derived over the course of the project have now been combined for the first time. "It is like asking, 'How do lions, zebras and cheetahs use Africa as a whole continent? ', only we have done it for a vast ocean," says Barbara Block, a marine scientist at Stanford University in California and lead author of the paper. "We have had single-species papers before on a lot of the migration patterns, but they have never been put together as a whole." The combined data from the tagged species, which carefully removes any bias introduced from where the animals had been tagged, shows two 'hotspot' regions where the predators' migration routes concentrate in the north Pacific. These are the south-flowing California Current off the United States, and the North Pacific transition zone (NPTZ), which runs east–west between Hawaii and Alaska along a boundary between cold sub-Arctic waters and warmer subtropical waters, and which acts like a trans-oceanic migration highway. "These are the oceanic locations where food is most abundant, and that's driven by high primary productivity at the base of the food chain. These areas are the savannah grasslands of the sea," says Block. 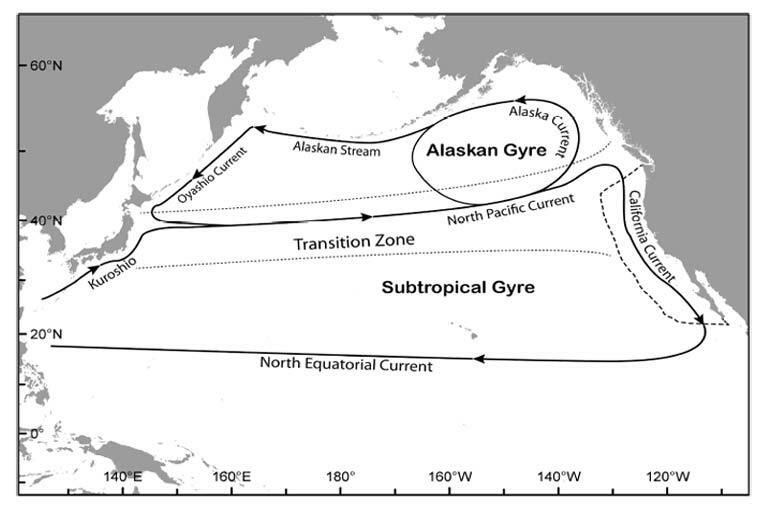 Schematic of dominant ocean current features in the north Paciﬁc Ocean. The California Current Large Marine Ecosystem is outlined (dashed line). The north Paciﬁc Transition Zone is delineated by the dotted lines. Combining movement and physical data from so many tags can help to explain the behaviour patterns observed. For example, populations of salmon sharks, white sharks and mako sharks can be seen to "split the turf of the central and eastern Pacific", says Block. Records from the tags show that slightly different preferences for water temperature prevent the closely related species from treading on one another's fins. The work also shows that many species with long migratory paths — including yellowfin tuna, bluefin tuna, white sharks, elephant seals and salmon sharks — return faithfully from their migration to the same region every season. "For me, this homing capacity has been the biggest surprise," says Block. "We didn't really know these creatures had neighbourhoods." Patrick Halpin, a marine geospatial ecologist at Duke University in Durham, North Carolina, who is a member of the Census of Marine Life but not of TOPP, says that the study is groundbreaking, providing not only a comprehensive picture of patterns of marine-predator behaviour in the region, but also a methodological framework for further broad-scale studies. "Future analyses originating from other regions will likely fill in a more comprehensive picture of the entire Pacific basin and identify additional hotspots," he says. David Sims, a behavioural ecologist at the Marine Biological Association in Plymouth, UK, also praises the study, noting its "unprecedented number" of electronic tags. "They have launched marine animal behaviour as a 'big' science, rivalling in ambition, perhaps, some large projects in astronomy or physics," he says. Block says that information from the study could aid efforts to protect and conserve the biodiversity of the hotspots. Knowing where and when species overlap is valuable information for efforts to manage and protect critical species and ecosystems, she says. 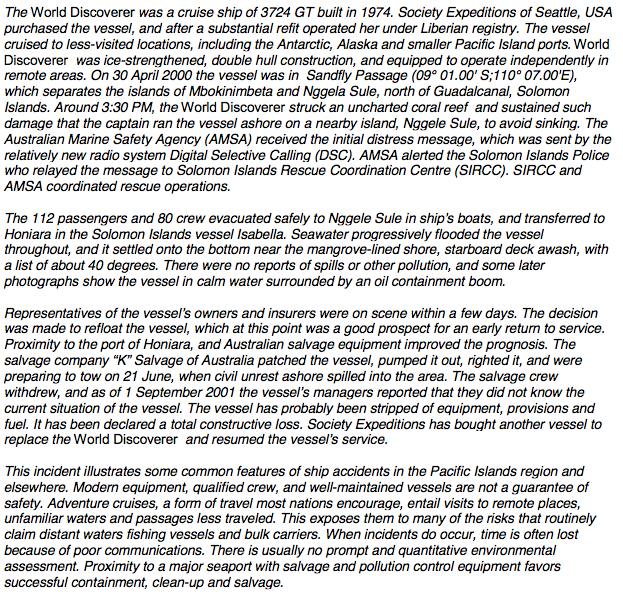 Sunday April 30, 2000 was not a good day for the World Discoverer, a cruise ship originally built in Germany, in 1974. 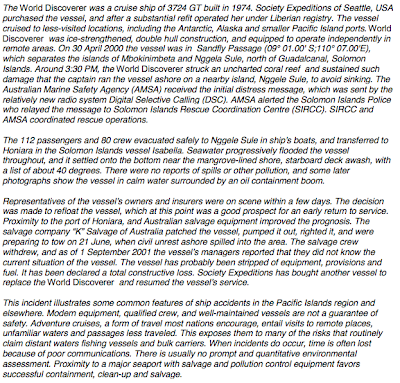 At 4pm local time, she hit a coral reef that wasn't in the Solomon Islands charts. All 99 passengers and crew aboard the US-owned World Discoverer were evacuated amid fears the ship was about to capsize. The passengers were ferried from the World Discoverer to nearby Ngella island and later taken to the main Solomon island of Guadalcanal by charter vessel. The captain then brought the ship into Roderick Bay after the ship began to list 20 degrees and grounded the ship to avoid sinking. Michael Lomax, president of Society Expeditions, which runs the World Discoverer out of Seattle, said the ship struck an uncharted coral reef in Sandfly Passage, 20 miles north of the Honiara. "The captain, Oliver Kruess, thought it was necessary to take the vessel and run it up on to the beach so as to safely evacuate the passengers and the crew members," Mr Lomax said. After underwater surveying of the ship, the World Discoverer was declared a "Constructive Loss". There are no reports of any oil or petroleum or other pollutant spills were reported as a result of the impact. The video captures clouds as they form into a thunderstorm. In Late 2010, Murray Fredericks made an initial visit to Melville Island situated in the Arafura sea North of the Australian mainland. During the 'build-up' season, prior to the monsoon, a huge storm event known as 'Hector' occurs almost daily over the Tiwi Islands. Theses storms are known as the worlds largest thunderstorm which, given the right conditions, can merge into a 'super-cell' or a giant storm known as a 'Hector'. As with the Salt Project, the process for Hector commenced with finding a location where the storms could be photographed over a flat horizon. This is a 'minimal' approach, intending to deny the elements or language of a traditional 'landscape'. The subject becomes the storm itself rather than scene it sits within. The first exhibition of stills from the project was on exhibition in Melbourne at Arc 1 Gallery from the 24th of May until the 18th of June. YouTube : Other timelapse video of "Hector the convector" storm with large updrafts over the Tiwi Islands, Australia viewed from Darwin over 70km away! Hector can reach heights over 20km or 70000 ft!